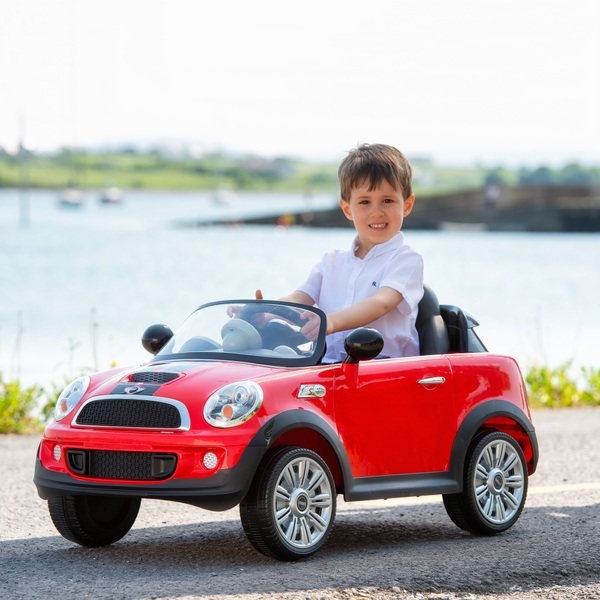 Let your little one take the wheel in the Mini Cooper 6V Ride On with Remote Control. This cute electric ride on has both parent-guided and child-controlled modes, so you can drive your way. Cute, sporty and fun to drive, this electric ride on is just like the real thing. Little ones can fasten the seat belt, flash the working LED headlights for role play fun, and easily drive forward or reverse using the foot pedal and steering wheel. In parent-guided mode, the Mini Cooper 6V Ride On with Remote Control lets you control the speed and power. Little ones stay in control of the steering, but the rest is controlled by the 2.4GHz parent remote. This mode of play is perfect for kids whose feet can’t quite reach the drive pedal—or for little ones who just need a helping hand sometimes. The Mini Cooper 6V Ride On with Remote Control features rubber non- slip tyre strips for safety, with a top speed of 4km/h. The long- lasting rechargeable battery lets kids enjoy up to an hour of driving un every time. This fun electric ride on is styled with classic Mini bonnet stripes and the iconic Mini logo. EU Warning: Not suitable for children under the age of 3 years due to small parts which could cause a choking hazard. To be used under the direct supervision of an adult.